After a venerable career of endless, stellar successes the greatest director who ever lived is in his prime and preparing for his most ambitious project ever when he unexpectedly dies and is called home to heaven. Peter meets him at the gate. "So sorry about your untimely death," he tells the director. "But God himself has called you home. You see, God wants you to direct a movie for Him." 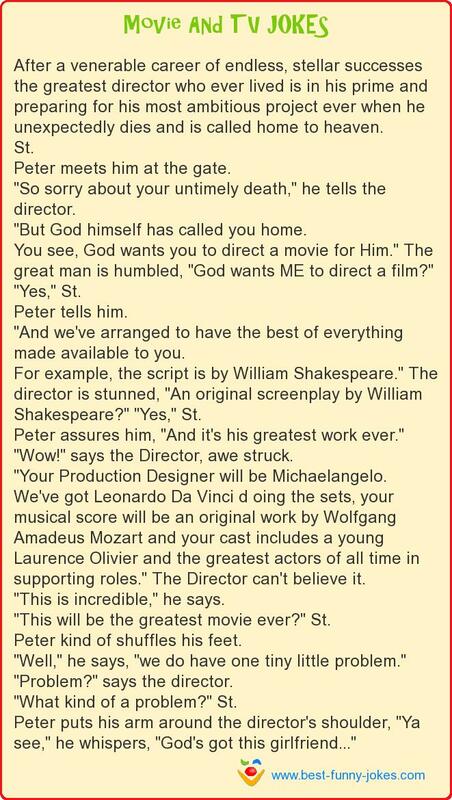 The great man is humbled, "God wants ME to direct a film?" "Yes," St.
"And we've arranged to have the best of everything made available to you. For example, the script is by William Shakespeare." The director is stunned, "An original screenplay by William Shakespeare?" "Yes," St.
Peter assures him, "And it's his greatest work ever." "Wow!" says the Director, awe struck. "Your Production Designer will be Michaelangelo. We've got Leonardo Da Vinci d oing the sets, your musical score will be an original work by Wolfgang Amadeus Mozart and your cast includes a young Laurence Olivier and the greatest actors of all time in supporting roles." The Director can't believe it. "This is incredible," he says. "This will be the greatest movie ever?" St.
Peter kind of shuffles his feet. "Well," he says, "we do have one tiny little problem." "Problem?" says the director. "What kind of a problem?" St.
Peter puts his arm around the director's shoulder, "Ya see," he whispers, "God's got this girlfriend..."